Two beauty professionals with more than 70 years of combined beauty expertise have united for one vision -- makeup that is more than just color. 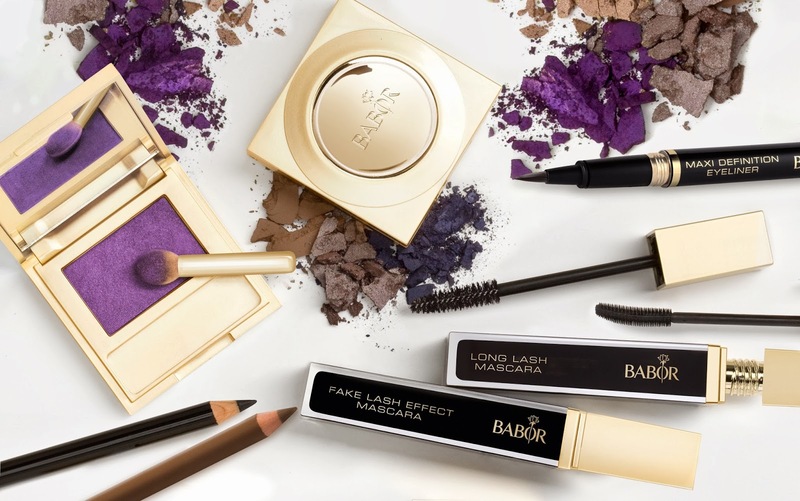 World-renowned makeup artist Peter Schmidinger has developed an exclusive collection for Babor Cosmetics called The Babor Face Design Collection! As one of the leading skin care brands worldwide, Babor sought to create a collection that would not only make the skin of every woman look beautiful, but more importantly - care for it with ingredients found in some of Babor’s most effective products. This new range offers protection, treatment, regeneration and color all in one thanks to the active “lifting” ingredient complex specially developed for the line. Samphire extracts help regenerate, Vitamin E effectively protects from free radicals, and Lupine Oil regenerates and protects the skin barrier. The amino acid complex L-PCA also gives additional moisture. Babor Deluxe Foundation ($42) - Has a rich, creamy texture with a lifting effect. Conceals small imperfections. The coated “Stay True” pigments merge with the skin and guarantee true lasting color and long storage life. Hyaluronan and wheat proteins provide moisture. It protects, treats and regenerates thanks to its lifting complex. 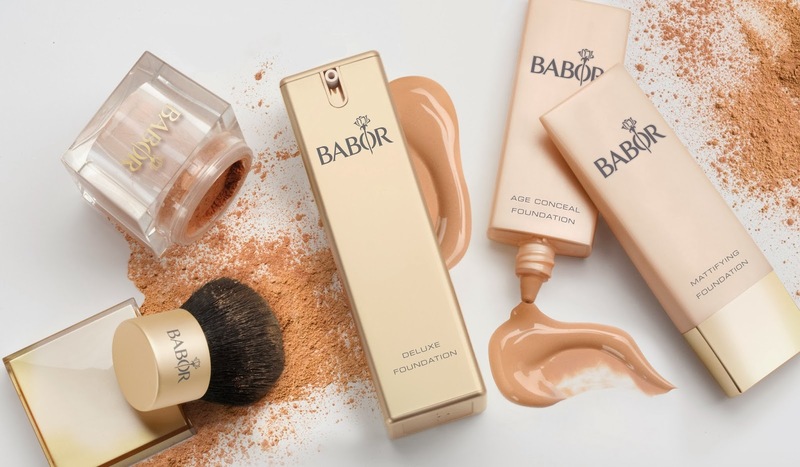 Babor Age Conceal Foundation ($42) - The Anti-Age Foundation fluid regenerates all skin types with live pumpkin and retinol cells. Light dispersing pigments visually conceal lines and give natural UVA protection. Babor Mattifying Foundation ($42)- Light, creamy texture with a light powdery finish – stays put all day long and prevents bothersome shine. With coated “Stay True” pigments that give true lasting color and a lipid complex made from olive oil. It protects, treats and regenerates thanks to its lifting complex. Babor Mineral Powder Foundation ($42) - It is loose and light like powder, but has the concealing properties of a foundation. It consists of 99% minerals that give the skin a slight shimmer, making it look fresh and natural. Does not contain oils, wax, perfume, talc or artificial colors. Mild on skin. Apply with a kabuki-brush using circular strokes and work into the skin. Barbor Perfect Finish Foundation ($42) - A silky compact foundation and powder in one. Applied with a sponge, it gives an even matte finish and covers any minor imperfections. For thicker coverage, can also be applied wet. Applied with a make-up brush, it acts like a compact powder to set and mattify make-up. Perfect Skin Illuminator ($32) - A brightener in a luxurious metal case with a practical applicator brush. It is long lasting and conceals small imperfections perfectly. The mimetic pigments do not build up in lines no matter what facial movements your face makes. It protects, treats and regenerates thanks to its lifting complex. Super Soft Duo Blush ($35) - Dual colored powder blush with a filler effect. With the two colors you can effectively brighten and add shadows. The different sized powder particles fill up lines giving the face an even complexion. It protects, treats and regenerates thanks to its lifting complex. Does not contain methylbenzene or formaldehyde. Maxi Definition Eye Brow Pencil ($12) - The eyebrow pencil for easy eyebrow tracing that does not smudge. Comes with a handy brush at the end of the pencil. Advanced Eye Shadow Base ($17) - Eyelid foundation with a super soft cream- to-powder texture. It covers small blood vessels and redness, prolongs the wear of eye shadow and prevents build up in the crease of the lid. Super Soft Eye Shadow ($22) - Silky eye shadow made with plant oils, beeswax and wheat starch. Great cover- age, long lasting and makes the eyes shine. The lifting complex offers protection from environmental stress while treating and regenerating the skin. Maxi Definition Eye Contour Pencil ($12) - Very long lasting, water-resistant eyeliner with excellent color delivery and coverage. Ceramide III and pearl proteins provide moisture and help to regenerate. Comes with a handy little sponge. Maxi Definition Eye Liner ($16) - A high precision eyeliner in a luxurious metal case with an innovative calligraphy tip for drawing precise and fine lines. Refillable with the custom- made cartridge refill system. Available in black. Long Lash Mascasra ($26) - The innovative curved precision brush forms and lengthens lashes in one stroke. An innovative coating guarantees a long lasting effect. Panthenol provides moisture. Fake Lash Effect Mascara ($26) - The volume brush thickens, divides and forms the lashes. A special polymer visibly gives the lashes more volume. The innovative coating guarantees a long lasting effect and prevents clumping. Panthenol provides moisture. Maxi Volume Mascara ($26) - Thanks to the innovative elastomer brush the mascara provides more volume and guarantees perfect lash definition. For beautiful, expressive eyes. Advanced Lip Base ($21) - Advanced lip primer with a creamy anti-age texture. Hyaluronan micro spheres give lips more volume and moisture, smoothing lines and making the lips look more even. Lipstick and lip gloss stay on noticeably longer. Maxi Definition Lip Liner ($15) - Long lasting, water-resistant lip liner with excellent color delivery and great coverage. Contains carnauba and candelilla wax as well as vitamin E. Provides moisture. Prevents lipstick from running into the lip contour. Comes with a handy lip brush. Ultra Performance Lip Colour ($25) -An innovative new formula with a visible lifting effect. It creates a thin film without sticking or just lying on the surface. High gloss, long lasting and very true color. The lifting complex protects the sensitive skin of the lips from environmental stress while treating and regenerating it. Ultra Shine Lip Gloss ($19) - Ultra brilliant lip gloss with a visible lifting effect. The smooth highly elastic film does not stick or just lie on the surface of the lips. The lifting complex protects the sensitive skin of the lips from environmental stress while treating and regenerating it. Ultra Performance Nail Colour ($13) - This nail polish is quick drying, long lasting and combines high gloss and even application in an innovative high-tech formula. Does not contain methylbenzene or formaldehyde. Advanced Nail White ($13) - Nail polish with a subtle French manicure look and a visual brightener for whiter, brighter nails. This high-tech formula does not contain methylbenzene or formaldehyde. Cuticle Remover ($13) - A soft gel for removing cuticles: apply to cuticles around the nail, leave it on, gently push the cuticles back with a rosewood cuticle pusher and you are finished. Smart All In One Polish ($13) - Multifunctional treatment polish with minerals. Excellent for use as a base or finishing coat, color sealer, nail strengthener, or to freshen up color shine. Made with strong minerals. Does not contain methylbenzene or formaldehyde. Nail Treatment Oil ($13) - A rich conditioning oil for nails and cuticles. Prevents the tearing of cuticles. Nails grow back more even and become stronger with regular use. Prevents nail breakage. Rich in almond, avocado, olive, apricot and shambrilla oil as well as vitamin E, bisabol oil and canola oil. The Babor Face Design Collection is available online at Babor and select retail locations.